A double batch of these Sugar Cookie Bars. I’ve wanted to make them forever. I plan to jazz them up with red and green sprinkles, naturally. Butterscotch Confetti Square. My favorite dessert of all time and a total classic. If there’s a pan of this stuff around, I’m a total goner. I love it with colored marshmallows best. Chocolate Peanut Butter Confetti Square. I just replace the butterscotch chips with milk chocolate and use white marshmallows. Also a crowd pleaser. A double batch of my favorite brownies with a twist. I’m going to bake them in mini muffin tins and press a red or green M&M into the middle right when they come out of the oven. Avalanche Drops. 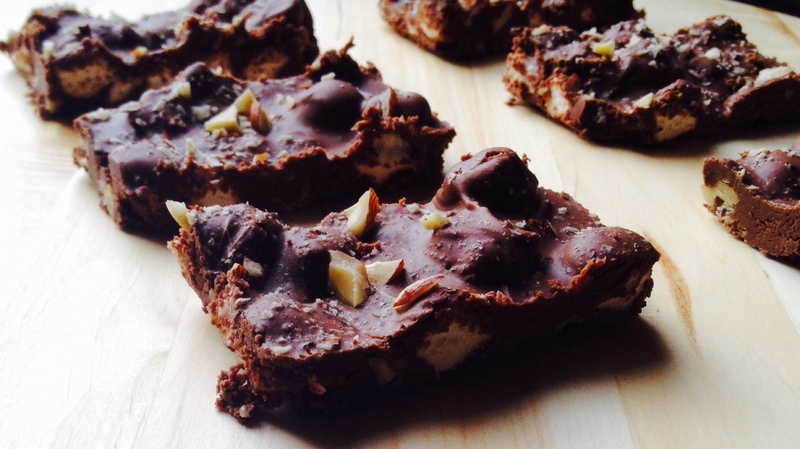 A new salty & sweet no-bake recipe I’ve been working on. I’ll share the recipe soon! Another new recipe I have in store for you: Salted Nutella Confetti Square (pictured above). I’ve played around with the original and this version tastes like Ferrero Rocher. Seriously. Snickers Brownie Cups. I knew as soon as I tasted one that they’d be added to my Christmas baking lineup. I’m considering a mini size for these as well. This No-Bake Oreo Cheesecake. My siblings requested a cheesecake dessert for our Christmas Eve celebration this year and I’ve decided on this one because it’s fantastic and incredibly simple to make. If nothing else, this list should indicate how much I love chocolate.